A material called sodium manganese dioxide has shown promise for use in electrodes in rechargeable batteries. Now a team of researchers has produced the first detailed visualization—down to the level of individual atoms—of exactly how the material behaves during charging and discharging, in the process elucidating an exotic molecular state that may help in understanding superconductivity. The new findings are reported this week in the journal Nature Materials, in a paper by MIT postdoc Xin Li, professors Young Lee and Gerbrand Ceder, also of MIT, and 12 others. The phenomenon the team investigated—known as the cooperative Jahn-Teller effect —"is a basic piece of physics that has been well-known historically," explains Ceder, the R.P. Simmons Professor of Materials Science and Engineering. It describes how the positions of atoms in certain compounds can be slightly distorted, changing the material's electrical and magnetic properties. "It is associated with a lot of interesting phenomena," Ceder says—so a better understanding could be useful both in advancing our knowledge of physics and in potential applications, from improved batteries to new kinds of electronics. While the Jahn-Teller phenomenon is well-known, Ceder says it's a bit unusual to see it in battery compounds such as the sodium manganese dioxide now under investigation as a possible lower-cost substitute for the lithium-based electrodes in lithium-ion batteries. Such rechargeable batteries work when an electrical current pulls ions out of an electrode during charging, then returns them to the electrode as the battery is used. The arrangement of atoms within the material "is very ordered, and normally the ordering is driven by fairly standard physics," Ceder says. "But in this material, the order is completely driven by the Jahn-Teller effect." Understanding how that difference affects charging and discharging could be important in guiding teams around the world who are seeking to improve the performance of such batteries, but it proved a daunting challenge for the MIT team. The team combined density functional theory with technologies including electron diffraction; synchrotron X-ray diffraction; neutron diffraction; and aberration-corrected atomic-resolution scanning microscopy for direct visualization. 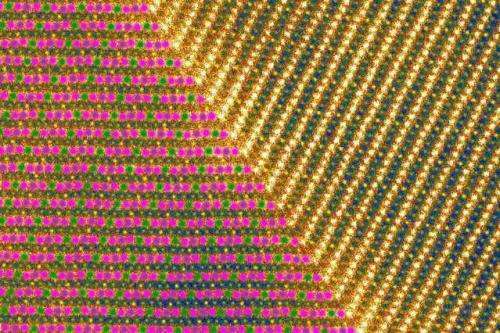 Using these methods, the researchers showed that the material produces a "superstructure" governed by the Jahn-Teller effect; at very low temperatures, it produces a kind of "magnetic stripe sandwich," with alternating stripes of ferrimagnetic and antiferromagnetic atomic chains. "This is fundamental work," Li says, to determine "any intrinsic capacity limits to sodium manganese dioxide"—such as how much charge it can hold, or how many times it can go through the charge-discharge cycle without degradation. The ultimate goal is to find out "how [to] make a higher-capacity sodium-ion battery electrode," Li says. In addition to possible battery applications, the work led to the finding that sodium manganese dioxide forms bands of magnetic domains at temperatures of 60 kelvins (-352 degrees Fahrenheit) or less. This finding, Li says, may be important to the emerging field of spin electronics, where the spin states of electrons, rather than their electrical charges, carry and store information. Even before this new research, Li says, batteries made of this sodium-ion composition "showed comparable capacity to the commercial lithium-ion batteries," which are one of the leading technologies in production today. While no companies are now producing sodium-ion batteries, the technology has great potential: Sodium is more abundant, less expensive, and safer to work with than lithium. "This is still fairly basic research," Li says, adding: "Understanding always pushes us forward, especially in this field. You only make progress by understanding these materials better."